Technology is about to seriously change the face of interior design — and that’s a good thing. The process of dreaming up new looks, choosing color schemes, and previewing final results will never be the same now that the digital age has finally caught up to this long-staid industry. While it used to involve lots of face-to-face meetings between clients and designers, physically browsing warehouses full of swatches, waiting for samples to come in from afar, and hand-sketching concepts, new tools have emerged that make life a whole lot easier for all parties involved. On top of that, the rise of smart homes and innovative materials stands to revolutionize the way we design interiors on their most fundamental levels. Digital design startups like Homepolish and Houzz foster new connections between clients and designers. Designers create profiles on these sites, and clients browse their collections of inspirational images and curated products, with the option to either purchase goods from the designer on the spot or hire them for a new project. Sketching out interiors to scale on a drafting table is a thing of the past (though still treasured by some designers) now that digital tools like SketchUp, RoomSketcher and Autodesk’s range of creative programs place the creation of highly accurate, hyper-realistic renderings within easy reach. 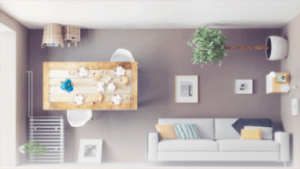 Interior designers can use 3D modeling programs like these to plan out complex surfaces and visualize three-dimensional spaces, filling the resulting digital rooms with furniture, art, rugs, and decorative items with the tap of their finger. Clients can try out virtually endless colors, textures, and shapes, giving them a much better idea of what their interiors will look like when the whole process is complete. While there’s nothing quite like feeling a textile with your own two hands, smartphones and digital meeting software can be nice for eliminating unnecessary in-person meetings. Interior designers can now use video chats to show their clients the scale of a planter or vase, display upholstery fabric in different lights, and demonstrate the lushness of the nap of a carpet. Would you put on a pair of virtual reality goggles to sift through an enormous showroom full of well-organized interior design products instead of traveling to multiple warehouses in person? Virtual and augmented reality technologies make that 100-percent possible. Even more impressively, virtual reality allows clients to see beyond the current state of a space and imagine what could be down to the smallest details. You may have seen this tech demonstrated on TV before, with a designer holding up a tablet against a physical room and moving it around to “reveal” elements that aren’t really there, but could be. Smart home features like programmable lighting, televisions that automatically pause when you get up from the couch, and thermostats that learn your family’s temperature preferences may still be a bit of a novelty, but soon enough, they’ll be the norm. This highly customizable technology has a low installation cost, and it’s getting more accessible to the average user by the hour. The ability to simplify the everyday management and maintenance of a home could change expectations around how much our homes can actually do for us. The best part is that many of these gadgets fade into the background visually, resulting in a cleaner look than those created by the stereo systems and large-screen televisions from decades past. This trend could eventually evolve into entire smart interiors, with elements appearing and disappearing with the wave of a hand over a motion sensor. Tipic’s smart Tuler kitchen for Offmat is one such example of this, with the sink dipping below the counter to offer more surface area when it’s not needed. Innovative materials are arriving on the scene so quickly, it’s hard to keep up with them all. Environmentally friendly plastic alternatives, surfaces that harvest energy from footsteps, and even highly malleable mushroom-based materials could all radically reshape the notion of a standard construction. E-glass can shift from transparent to opaque on demand, and synthetics like Corian can be embedded with LED lighting. In the near future, we might even see floors, countertops, and more made of materials that change color, texture, or shape before our eyes. Engineers have already developed squid-inspired “mechanochromic” materials that perform similar feats for use as smart windows, toys, and clothing. In short, advancing technology is nothing for the interior design industry to be afraid of. We’re entering an exciting new era that’s bringing us closer to the space age world envisioned back in the 20th century, but it looks even cooler than we expected.